The first year after moving to Mexico, a girlfriend asked if I could stay at her place in El Centro, the historic district of Mazatlán, for a few days and take care of her two standard poodles, a black and a white, dislodging me from my comfort zone of its Marina area where I live. After a little morning yoga, I wanted to test the speakers I'd brought in my overnight case so I plugged them in and tuned in to my favorite station on I Heart Radio, 93.3 in Denver and listened as D.J.s promoted an upcoming concert at Red Rocks Amphitheater there. Then I settled in on my laptop for most of the day and evening, working in a quick Skype conversation with a good friend also in Denver, a dip in the small pool outside and a little rough housing with Andy and Jackson. Fighting some guilt (I really should be studying my Spanish, I thought), I surrendered to an episode of Jane the Virgin (hilarious!) on Netflix before rising to click off the television screen. It happens now and then, that unexpected jolt that I am living in a foreign country. It always hits smack dab in the middle of what could be any single person's typical and altogether gratifying evening at home. As an expat in Mexico, sometimes a normal evening is all you need. But all you have to do is step outside to find a little excitement. If you're hungry, that might mean walking a few blocks to chaotic Mexican market for a fat roast chicken, hacked into six rust-colored pieces right in front of you by a chef delighted to do it. Then you may walk across the street for an horchata (a milky drink made with ground almonds) to go with it. You can get anything "para llevar, por favor" ("to go, please") and they wrap it all up with tender loving care...and a great deal of imagination. Almost any Mexican town will offer you the opportunity to stroll down to one of the local plazuelas and practice a little Spanish or buy some beautiful jewelry or leather bracelet from one of the artisans who gather in such public squares all over Mexico. Or may you will duck into some dusky little cantina for live music that seems to be everywhere in Mexico. If you're in a larger Mexican city like Mazatlán, you could invite a friend can to see a play, opera or ballet for less than $15. Whether your evening is always an adventure or sometimes a cozy night at home with the television or talking to friends back home, with technology you get to choose. That's why now is the time to consider life in Mexico. Yes, you can get almost anything you want in home entertainment, but it's not always easy - Ventanas Mexico. Hola, I'm a partner with Ventanas Mexico, which helps people explore living full or part time in Mexico. I am the author of the "Interactive Guide to Learning Spanish Free Online," which links you to the best free Spanish resources on the web. 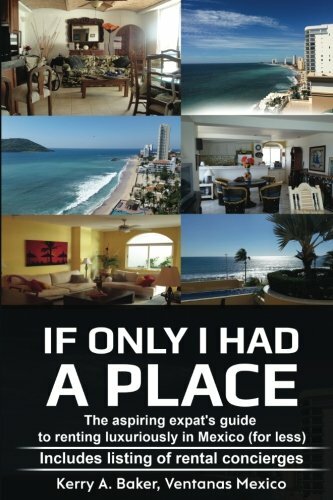 More recently, I've also just released "If Only I Had a Place," a guide for the aspiring expat on renting longer-term in Mexico." Why Not Work Remotely from Mexico?